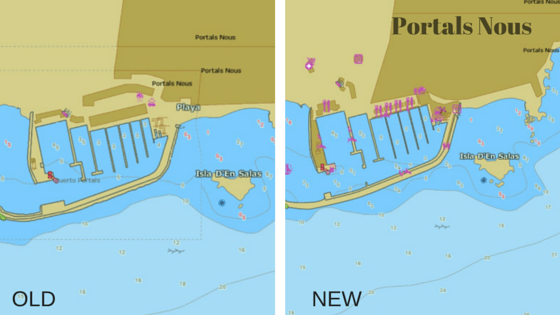 Lorsque vous êtes à bord de votre bateau et que vous souhaitez être géolocalisé, vous devez obligatoirement relier votre PC à un système GPS. Les logiciels TZ Navigator et TZ Professional sont capables de recevoir et de traiter l’ensemble des informations émises par vos appareils afin d’afficher votre position ainsi que des données complémentaires. Certains GPS ne sont pas pourvus de connexion port série habituel et peuvent être branchés en USB directement sur votre ordinateur. Découvrez ci-dessous les 3 étapes pour brancher, configurer et analyser votre GPS USB dans votre logiciel de navigation TIMEZERO via le système d’exploitation Windows. What does the average sport fishing professional use to catch more fish you ask? Well if you already have your fishing equipment then let’s look at the electronic equipment. While you will probably have a GPS connected, it will be necessary to set this up with your sport fishing software. This is even possible remotely in some cases. Make sure your GPS is NMEA-0813 standard! NMEA-0813 sounds a bit complicated but it is a standard for electrical and data communication that is understood by all marine electronics. It also lets you convert the GPS data to your VHF radio on your boat in case of an incident so that your VHF can then relay your positioning. For more info on NMEA-0813 click here. There is also a new NMEA standard, NMEA-2000 that will eventually replace NMEA-0813. This new standard will provide a higher baud rate (more information per second can be sent) allowing for multiple speakers at any one time amongst other improvements. Professional sport fishing has become more sophisticated and now most sport fishing professionals are using sounders that are capable of providing the bathymetry of the seafloor as well as capturing shoals of fish. If you have a waterproof environment then you can connect up your sounder to a software and in some cases in can be done wirelessly. Perhaps you have also asked what is a sounder exactly. The real difference between a sounder and a sonar is that a sonar scans 360 degrees, whereas a sounder, also known as a fixed mount transducer scans for fish and the sea floor in one direction. When searching for sounders, you should look for one that is labelled as a “fish finder”. For TIMEZERO software, if you pick up a Furuno fish finder, you will get full compatibility for TZ Professional v3 (for compatibility check the Furuno website). The following features are displayable directly within the software: Sounder Echogram, Accu-Fish, Bottom Discrimination. This feature displays fish with amazing clarity by cleaning up the “noise” from the sounder. But not only does it find and display fish, it can identify fish and provide historic data (up to 3 minutes), so you won’t miss a thing! There is also the possibility to geolocate the fish so you can get to the spot where the fish are more accurately. This feature is designed to analyse the data and estimate the fish size (of individual fish). 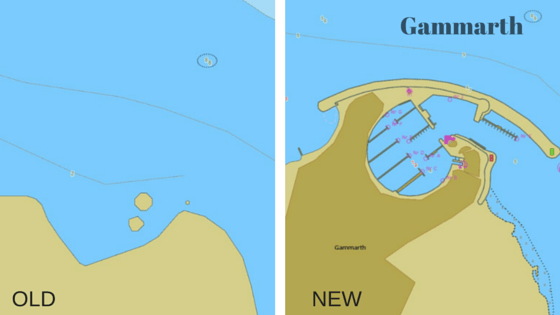 This feature’s main purpose is to locate a gold mine of a fishing ground or just the best spots in your local area, to maximise your catch. It determines what the seafloor is made up of, so for example, it can determine whether it is mud, sand, gravel or rock. It does this by determining the filtration rate of the sounder echo waves. While MFDs have recently been a very popular choice with products such as the TZ Touch 2 being ideal sport fishing gear, sport fishing software is now a great choice. TZ Professional v3 with the Sounder & PBG module will allow you to do more than you think! One example of how software helps you capture fish smarter is using your sounder connected to your PC to scan and collect bathymetry data in real time. If you are looking for a specific type of fish in a certain area, then having accurate bathymetry data will let you know where your best bet is by highlighting areas of only a certain depth. Once the fishing area has been configured, you can manually configure the contour lines to be as precise as 0.2m which will display a new contour line every 5th contour. One problem that even the most expert of sounder users encounter is that the colour doesn’t always change when focusing on certain depth lines, which is another advantage of our TZ Professional v3. It can be manually colour coded, meaning that even when you get into precise measurements, the software is as easy to read and understand as ever. From there you can scan the sea for fish until you hit gold. The evolution of PBG software for PCs has developed a lot over a short space of time. This image shows the evolution of resolution that you can display (recently increased two-fold, now 1.5m x 1.5m). Extrapolate PBG data automatically in real time with seamless customizing of brush size, is just one of the advantages of TZ Professional v3 navigation software. Another advantage is that TZ Professional v3 will even automatically identify and remove “erroneous” PBG data which will definitely be an addition for you to really use your sounder to its fullest potential. For more information on TZ Professional v3, click here. How do I set up my instruments? Ok but getting the electronic equipment is only half the battle, how do I connect everything up and know whether it is working or not before I set out on my boat? Let’s take a look at connecting instruments and what the different types of electrical specification are. The equipment must be in either NMEA-0183 or NMEA-2000 in order for the information to be compatible from one instrument to another. In order to connect instruments, there are actually 2 different connectors: RS-232 and RS-422. The RS-232 is your standard PC COM port and you probably have one on your PC (although now the majority of laptops have now switched to HDMI). The image shows how the PC only requires two wires to be connected as it is only receiving information from the GPS. You will know if your GPS is running RS-232 or RS-422 by the amount of wires it has. RS-232 has 3 wires (transceiver, receiver and common ground) whereas RS-422 has 4 (2 transceiver and 2 receiver wires). With Furuno depth sounders you can connect directly via a network cable or by RS-422. So if you are going down the route of a RS-422 connecter and you want it to connect to a serial COM port then you will have to use a RS-422 to RS-232 adapter. The RS-422 differs from the RS-232 in that it does not use a common ground wire, instead it uses 4 wires: TD-A (Transmit Positive), TD-B (Transmit Negative), RD-A (Receive Positive) and RD-B (Receive Negative). Depending on whether you want to talk back to the sounder or not, you may wish to connect up the TD-A and TD-B wires of the converter, however in this example let’s just look at receiver wires. The white wire from the converter needs to be connected to the RD-A and the black wire to the RD-B. Why does RS-422 provide more accurate data than RS-232? The RS-422 differs from the RS-232 by having two wires each for sending and receiving and then detects the voltage “difference” between them. This provides more accurate data because the noise that can cause erroneous results affects both wires in more or less the same way and seeing as the receiving side only detects the difference in voltage, it eradicates the noise problem. Having already established that a serial port won’t work for modern day laptops, let’s look at how to connect a serial to USB adapter. You simply need to go to any electric store and pick up a converter. Once you have the hardware, download a driver (either from the CD that comes with the converter or online) which will then allow the PC to recognize the instrument in a virtual COM port. Once everything is set-up you will need to go into the Control Panel and make sure that your PC can see the virtual port in Device Manager. As soon as you have everything in order you can go out and start fishing smarter by catching bigger fish in the best areas! 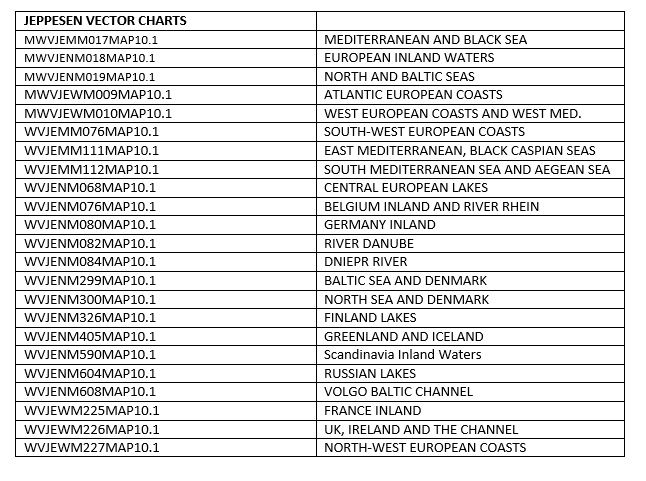 We just wanted to let you know we have fresh new Jeppesen vector charts that cover Europe available from 10th May 2016. 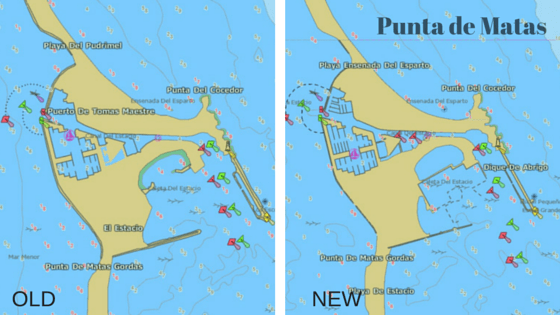 Below you can see examples of changes made to the areas. Don’t forget to update your charts!